FERC turns to resilience, utilities embrace storage and renewables face new obstacles. Here's what we're watching in the year ahead. 2017 was a whirlwind for the electric power sector. The utility industry saw the death of two utility mega-projects, jaw-dropping prices for renewable energy and storage and a federal subsidy proposal that threatened to “blow up” the wholesale power markets. And that was just the second half of the year. 2018 promises to be no different. From EPA speeding through a Clean Power Plan replacement to FERC's "truncated" resilience docket and the first federal pipeline policy review since 1999, the sector's plate is full even before state and local issues come into play. Fortunately, events of the last year give a good indication of which issues are likely to dominate in 2018. Here's what we'll be watching. Not a month into the new year and the sector's buzzword is resilience. Utilities and regulators have long addressed resilience — the ability to bounce back from power outages — through resources like fast-start plants and microgrids. But the concept gained new significance in September when Secretary of Energy Rick Perry positioned it as a central justification for a proposed rule at the Federal Energy Regulatory Commission to subsidize coal and nuclear plants. Finding ways to reduce customer outage hours will be a chief focus of FERC's resilience docket and similar state grid modernization efforts. FERC largely agreed, writing in a 5-0 rejection that DOE and its allies failed to prove the fuel security provision would improve the grid. Regulators, however, lauded the DOE's focus on resilience, asking regional grid operators to report back in 60 days about how it can be enhanced. Perry "asked the right question," said Commissioner Neil Chatterjee, but "proposed the wrong remedy." FERC's new grid resilience docket ensures that a main focus of the power sector in 2018 will be finding technologies and market rules that can drive down the customer outage hours. Industry stakeholders have 30 days to comment on the FERC docket after the grid operators' deadline, but the proceeding could well run longer, so expect a flurry of lobbying from power groups on how to value their "resiliency attributes" in the months to come. Perry's proposal to save coal and nuclear plants filled the headlines in the last quarter of 2017, but regional grid operators have been working for years on more gradual pricing changes that could benefit the same resources. Proposals working their way through markets like PJM, ISO-New England, MISO and others differ in construction, but have a similar aim: boost payments to existing generators in the face of low wholesale power prices. The goal is to ensure enough of these plants can recover their costs so they do not go offline, threatening reliability. FERC held a technical conference last May on such solutions, and regulators hailed PJM and ISO-NE proposals in their rejection of the DOE grid rule, saying the pricing reforms could contribute to grid resilience. On the same day FERC issued that decision, ISO-NE filed its two-part capacity market proposal with the agency. PJM followed suit weeks later, submitting its capacity repricing proposal to FERC even before stakeholders voted on an alternative proposal. Like ISO-NE's plan, PJM's would establish a two-part capacity auction. Generators would bid as they normally do in the first, then PJM would adjust awarded prices based on the amount of subsidized resources in the market. A separate proposal would boost energy market prices to benefit "inflexible" coal and nuclear generators. PJM's capacity repricing proposal would boost prices for unsubsidized generators, aiming to help them cover fixed costs. The pricing reforms, however, are controversial. Environmental and consumer advocates label them as little more than an expensive ploy to bail out struggling generators that would typically retire in a competitive power market. An alternative proposal in PJM to expand the Minimum Offer Price Rule garnered more stakeholder support, but PJM staff rejected it, saying it would disrupt state power policies. The new FERC resilience docket is likely to stoke these debates in 2018. With the DOE proposal off the table, look for owners of large coal and nuclear assets to push for swift changes in price formation this year to keep their plants online. Much of the focus on wholesale pricing reforms stems from state efforts to shape their fuel mixes. In power markets, high levels of resources subsidized or mandated by law can drive down the prevailing price, making it difficult for older, less flexible generators to recover costs. The issue shows little sign of abating in 2018. Nuclear subsidies, the source of much derision in FERC's technical conference last year, are under consideration in Connecticut, Pennsylvania, Ohio and New Jersey, and the ones in place in Illinois and New York have so far stood firm against legal challenges. State policies for renewable resources will also be a focus, particularly for liberal states keen to buck the Trump administration's pro-fossil energy policies. In New England, lawmakers are looking to offshore wind and hydro imports as an alternative to new gas infrastructure, and in California, lawmakers are poised to debate a bill that would set a 100% renewable energy target for utilities. Liberal states looking to buck the Trump administration could strengthen the recent trend of RPS revisions and carbon targets. States are likely to make waves in carbon regulation as well. Early in January, Washington Gov. Jay Inslee (D) released a carbon pricing plan that would start at $20/ton, and Virginia could soon become the first Southern state to regulate carbon by joining the Regional Greenhouse Gas Initiative, a nine-state (plus D.C.) cap-and-trade system. States have always shaped their fuel mixes and environmental policies, but a chief driver of the zeal in many blue states today is the consistent and coordinated effort across the Trump administration to loosen regulations on the energy sector. In its first year, Trump appointees moved to review or rescind 60 environmental regulations and more than 30 at the EPA, including high-profile reversals of the Clean Power Plan, the Waters of the U.S. rule, methane regulations on oil and gas drilling, rules for coal ash disposal and more. Not all the rollbacks found immediate success — the D.C. Circuit Court of Appeals threw out EPA's methane rule rollback in July — and liberal states and environmental groups will challenge the White House at every juncture. But administration officials are also changing the way agencies work. EPA administrator Scott Pruitt removed EPA-funded scientists from the agency's advisory boards, floated "red team/blue team" exercises to relitigate climate change and supported President Trump's proposal to cut the agency's budget by a third. None of these activities are likely to wane in 2018. Pruitt will try to finalize the EPA's rewrite of the Clean Power Plan this year so it can be defended by Trump’s legal team during his first term, Politico reported last month. That's a strategy the administration could deploy for a number of major regulations. In Utility Dive's 2017 survey, most respondents wanted the U.S. government to pursue a decarbonization policy, but were split on which it should be. All regulatory debates in 2018 promise to be contentious, but only one promises to take on a novel dimension. On Dec. 21, new FERC Chairman Kevin McIntyre announced the agency would conduct its first pipeline policy review since 1999, saying it was time for a "fresh look" at how regulators judge the "value and viability" of project applications. The decision comes during boom times for the natural gas industry and unprecedented public opposition to its infrastructure. FERC has only rejected two pipelines in the last 30 years, and despite being without a quorum for six months in 2017 approved more than 1,600 miles of pipelines. FERC approved more than 1,600 miles of pipelines in 2017 alone and early this year approved the Mountaineer and PennEast pipelines. Anti-pipeline groups say FERC is a rubber stamp for pipeline approvals, granting project approvals with little regard to state preference or impacts on communities and the environment. Regulators argue they are authorized by law to evaluate project need, not environmental impacts, and must authorize projects that can serve market demand. That could be about to change. Democratic FERC Commissioners Cheryl LaFleur and Richard Glick have both expressed skepticism with FERC's current evaluation process, particularly how FERC assesses market need. Republican Commissioners Robert Powelson and Chatterjee see no reason to change the process, and Chairman Kevin McIntyre has so far been tight-lipped about his views. But with three Republican Trump appointees on the commission, actions to streamline pipeline approval processes are more likely than new environmental rules. Chatterjee and Powelson have voiced support for shortening approval timelines though McIntyre's perspective remains unclear here as well. However the argument turns, the pipeline review promises to be a banner issue for FERC in 2018, and the policies it produces will shape energy infrastructure decisions for years to come. FERC's pipeline review comes as natural gas solidifies its role as the top U.S. generation fuel. Gas-fired plants first produced more power than coal on a monthly basis in April 2015. In 2016, gas surpassed coal for annual generation for the first time. Gas is likely to widen that gap in 2018. The Energy Information Administration expects gas to generate 33.1% of U.S. electricity this year to coal's 29.6%. 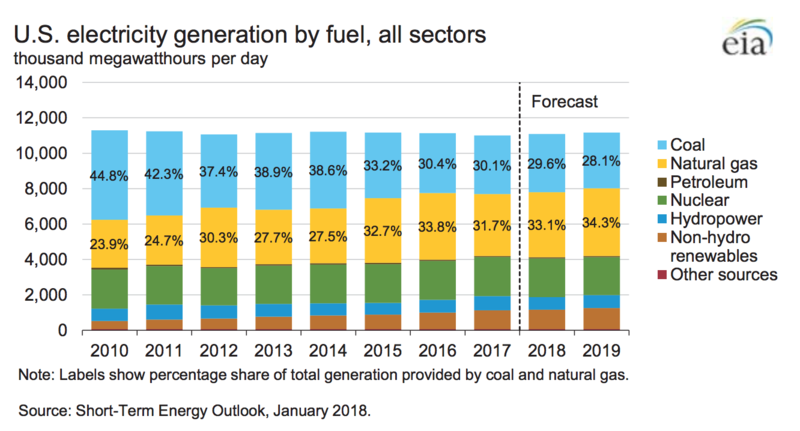 In 2019, gas's share grows to 34.3% as coal falls to nearly 28%. EIA expects gas prices to stay low in 2018, decreasing generation from coal-fired plants. Much of gas generation's competitiveness in wholesale markets comes from historically low natural gas prices due to advances in hydraulic fracturing and horizontal drilling. In 2018, EIA expects prices to fall. The agency estimates Henry Hub spot prices will average $2.88/MMBtu in 2018 and $2.92/MMBtu in 2019. The average price in 2017 was $2.99/MMBtu. The trend toward gas is expected to drive more retirements of coal generation. FERC expects 20.6 GW of coal-fired capacity to retire by 2020. Low gas prices kept wholesale power market prices low throughout most of 2017, fueling pricing reform discussions at regional grid operators and driving the DOE to propose a controversial cost recovery package for coal and nuclear plants. Those pricing reform discussions will likely be a focus after FERC rejected the DOE plan. In addition 2017 was witness to some eye-popping power contracts for large renewables and storage. In Xcel's all-source solicitation, which received bids last year, the median wind-plus-storage bid was $21/MWh and the median bid for solar-plus storage was $36/MWh. Previously, the lowest known bid for similar solar resources was $45/MWh in Arizona, released in May of 2017. 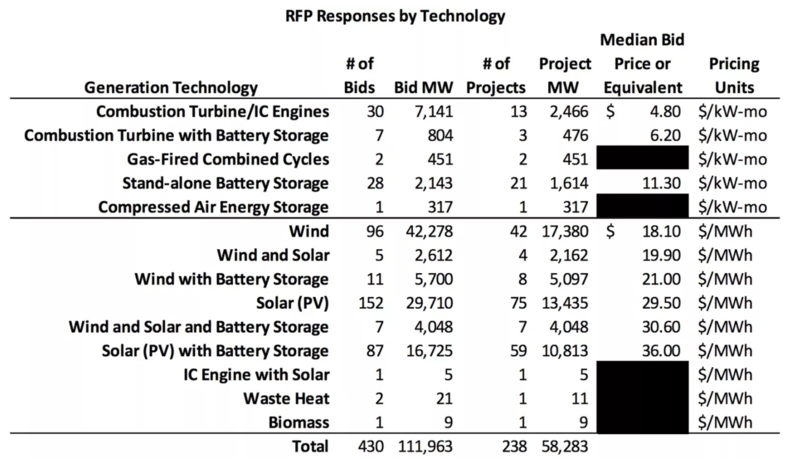 Analysts called renewable energy and storage offers in the Xcel RFP "incredible." Economies of scale and the preservation of federal tax incentives in the GOP tax overhaul would typically mean renewable energy prices would continue to decline, but other policy changes threaten to slow the sector's progress. President Trump in January imposed a 30% tariff on imported solar cells and modules, expected to reduce solar deployment 11%, or 7.6 GW, in the next four years. And the wind sector faces some uncertainty over a provision in the Republican tax law that could hamper the tax equity market used to finance projects. How the sector responds to these new policy challenges will say much about resource deployment in the coming years. Like renewable energy, battery storage is in the midst of rapid price declines and a growing appreciation among utilities across the country. But unlike renewables, it does not face any overwhelming federal policy roadblocks — if anything, the opposite. Buried beneath all of FERC’s resilience and price formation work is a proposed rulemaking to define market roles for energy storage — a proceeding commissioners have pledged to move this year. That could allow batteries to play a larger role in wholesale power markets where they so far have gained little traction. But regardless of federal progress, energy storage is fast becoming a central part of utility planning processes in all types of markets. 2017 was the first year storage was widely included in utility Integrated Resource Plans, from Indiana and North Carolina to Arizona, New Mexico and Oregon. The growing acceptance of storage comes as utilities gain confidence in its ability to replace traditional power infrastructure. In August 2017, Arizona Public Service announced it would use 8 MWh of batteries to defer a remote transmission upgrade. Then, in January, California regulators took the unprecedented step of asking Pacific Gas and Electric to consider how storage and other zero-carbon resources could replace three gas peaking plants. That order came after large battery arrays were quickly deployed to help mitigate for a natural gas shortage outside of Los Angeles. The utility business is a notoriously cautious one, with many companies opting to adopt technologies once they're proven by other entities. With increasing numbers of power providers demonstrating the potential of battery storage, 2018 could be the year it becomes a mature resource. Similar to storage, distributed energy resources (DERs) are positioned to gain broad utility acceptance in 2018. Long envisioned as a threat to reliability and finances, a number of utilities are realizing the potential of DERs to solve system needs usually reserved for bulk power assets like plants and transformers. In July, ConEd announced it would expand the best known of these non-wire alternatives (NWAs) — the Brooklyn-Queens Neighborhood Program — after deferring a $1.2 billion substation upgrade with 52 MW of demand reductions and 17 MW of distributed resource investments. ConEd's project is well known partly due to the visibility of New York's regulatory reform proceeding, Reforming the Energy Vision (REV), but DERs are assisting utility operations across the country. In May, the Bonneville Power Association announced it would not build an 80-mile transmission line, instead turning to distributed energy, storage and demand reductions. In California, Southern California Edison (SCE) and Pacific Gas and Electric (PG&E) each have multiple NWAs to address load growth and generation retirement. Respondents to Utility Dive's survey of 600 North American utility professionals indicated a clear desire to build business models for distributed energy. In another question, 73% said regulated utilities should be able to own and operate DERs "in all or most circumstances." As utilities gain greater familiarity with DERs, 2018 could be the year they truly come to see them as grid assets, rather than liabilities. 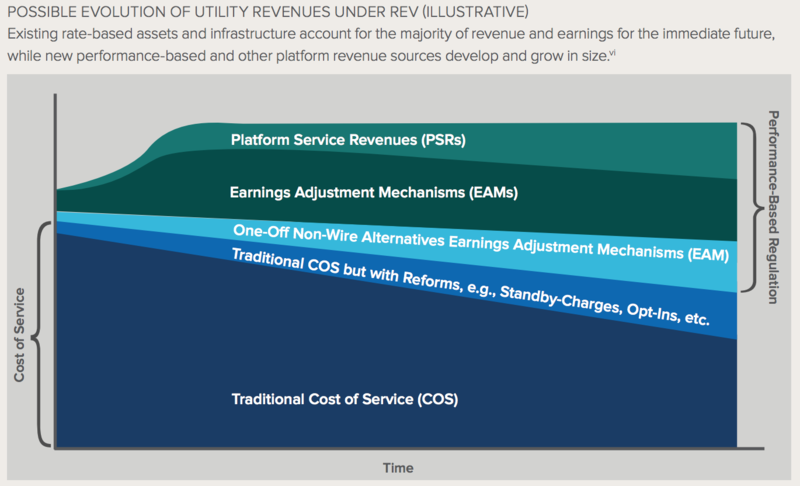 A chief driver of utility interest in non-wire alternatives is a trend in utility regulation away from traditional cost-of-service ratemaking and toward more performance-based regulation (PBR). New York's REV docket is the most well-known of these proceedings, but California had been implementing PBR standards since the mid-aughts, and investigations into PBR are active in Ohio, Rhode Island, Minnesota, D.C. and elsewhere. Each state gives its flavor to the debate, but the aim is similar: devise ways to compensate utilities for new energy services, like efficiency or DER deployment, that do not fit into the traditional utility ratemaking model. In places like New York, regulators are devising new markets for utility services and incentives for customer outcomes like efficiency, while in California the commission has relied more on mandates and enforcement. In the year ahead, PBR efforts could gain momentum from the push for grid resilience. A chief motivator behind the establishment of New York's REV was to incentivize the deployment of DERs like microgrids to enhance the grid’s durability. As more states look to beef up their power systems, commissions could turn to PBR to help them make a sturdier system. 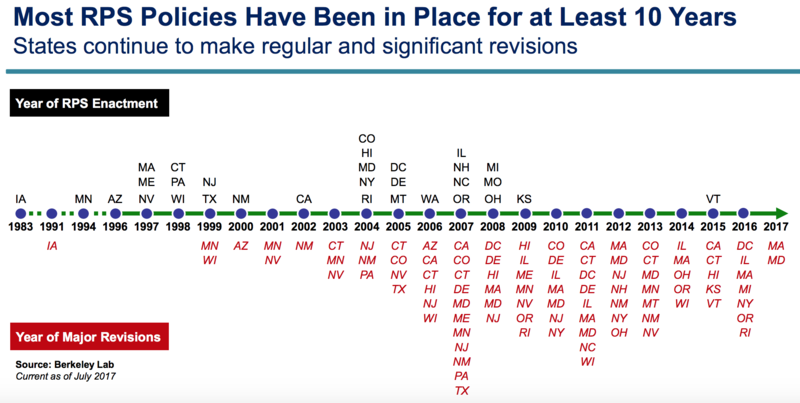 In states shifting to performance-based regulation, the traditional cost-of-service rate base could decrease as a proportion of total utility revenues over time. This post has been updated to reflect the Trump administration's solar tariff decision.